In point of fact, there were only a few problems. Among the small problems reported were the failure of two bus ticket-validation machines in Australia and 150 slot machines in Delaware’s race tracks. However, Wikipedia reported that the total global cost to resolve the “Y2K disaster” was estimated to be a stunning $300-$600 billion. That’s a lot of money spent on bad information. Vulnerability to such bad information is a common experience, and a top ten list of end-of-the-world predictions has some good examples. 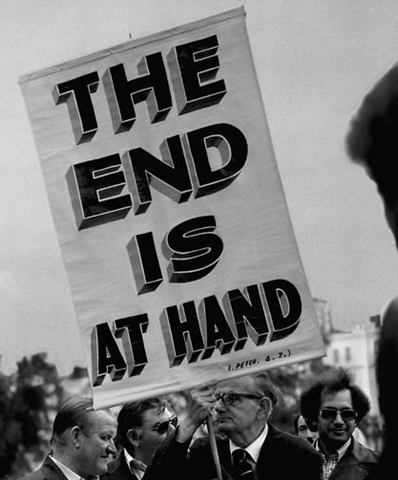 Hal Lindsey’s failed predictions in The Late Great Planet Earth, 1970.
and Charles Taz Russell’s (founder of the Jehovah’s Witnesses) prediction that the Second Coming of Christ would occur in 1914. Naiveté causes people to assume the truthfulness of a prophet or their favorite expert as seen in Letters to the Editor of any local newspaper. Opinions fly around about why a pot hole hasn’t been filled by the City or how a political leader is in conspiracy with the Chinese government. Though John wrote to a church, it sounds like he could have been commenting on a local scandal. He warned, “…do not believe every spirit, but test the spirits to see whether they are from God; for many false prophets have gone out into the world,” 1 John 4:1. Moses addressed the same issue of prophet truthfulness when he instructed, “If a prophet says something that does not take place or prove to be true, that is not someone speaking for God,” Deuteronomy 18:22. Centuries have past since John’s warning, but disinformation is still with us. In the 1980’s an urban legend circulated in paper form among churches saying that Madalyn Murray O’Hair was attempting to stop all religious broadcasting. The petition asking the FCC to stop the attempt even had a number for the bill she was supposedly submitting. All false, of course, but the hysteria it created was real. Nevertheless, most folks never bothered to call the FCC to check the truthfulness of the petition, and it continued to circulate in spite of the fact that it was never reported on by media nor did the FCC issue any directives against religious broadcasting. If you closed your eyes and listened to what Paul told young pastor Timothy in the last half of the first century, you’d swear that he was talking about Facebook. “I urged you to stay in Ephesus and instruct people not to be preoccupied with myths and speculation,” 1 Timothy 1:4,5. Paul knew the endless harm that was created by sharing lies and fabrications – stress, broken relationships, and misdirection. So we live in a world of pyramid schemes promising false wealth, herbal concoctions promising the cure for cancer, and well-coiffed televangelists promising a Bentley for every garage. But they’re all false prophets. Y2K is a vague memory now. So also the Mayan Calendar predictions of a 2012 end of the earth and Hal Lindsey’s false prophesies. The next charlatan pastor or power-hungry politician will develop a following of people who want to short-cut past important research and go straight to gullible acceptance. The apostle Paul warned against being like a reed being blown all about by every new, but false wind. Those who aren’t cautious end up buying the latest book on how to tithe yourself to a big house and a new car or getting that case of batteries for the time when the electrical grid goes down.